The Rev. James Gill of St. Andrew’s Episcopal Church offered ‘ashes to go’ downtown Wednesday. WINTHROP — The Rev. James Gill stood outside Apple Valley Books, his white clerical collar peeking above his scarf and heavy coat. The wind swept through the laminated medieval painting of one of Jesus’ disciples that Gill hung from a pole. “We call him flat Andrew,” Gill joked. Gill, vicar of St. Andrew’s Episcopal Church on Winthrop Center Road, carried a small canister of ashes, which he offered to apply to the heads of anyone who came within earshot. Gill, who had just applied the ashes to the foreheads of 17 people during a service at the church, now was braving the stinging cold and frozen sidewalks in hopes of getting a few more people to remember Ash Wednesday. The move from church to street corner began on Ash Wednesday 2010 when three Chicago-area congregations decided to offer ashes to passers-by. Dubbed Ashes to Go, the movement has taken hold nationally and even internationally. In 2013, ashes were offered in 31 states in addition to Canada, the United Kingdom and South Africa, according to AshesToGo.org. The Rev. Steven Lane, bishop of the Episcopal Diocese of Maine, encouraged vicars throughout the state to participate this year, Gill said. The Rev. George Lambert, of Christ Church Episcopal in Gardiner, offered ashes in that city’s downtown, Gill said. He estimated a dozen churches throughout the state were participating in Ashes to Go. Gill, 84, has been in the ministry for 60 years. Church attendance is declining, he said. Ash Wednesday marks the beginning of Lent, the 46-day period leading to Easter Sunday. Christians mark the period by giving things up, such as particular foods, or adding routine, such as daily devotions. The ashes, made by burning palm branches used on the previous year’s Palm Sunday, are applied to the forehead while reminding the recipient that they came from dust and will return to dust, Gill said. The few people who passed Gill as he bundled up against the cold politely declined his offer to take the ashes. One woman said she was Catholic and that she would receive the ashes at a service later that night at her church. The trickle of pedestrians prompted one of Gill’s parishioners, who showed up to help, to cross the street to the Flaky Tart Cafe. Moments later cafe co-owner Kim Cognata, still wearing her apron, traipsed across the street to receive the ashes. Cognata, who attends St. Francis Catholic Church in Winthrop, said she typically observes Ash Wednesday and Lent. “I would have gone to Mass this morning, but I was baking instead,” she said. 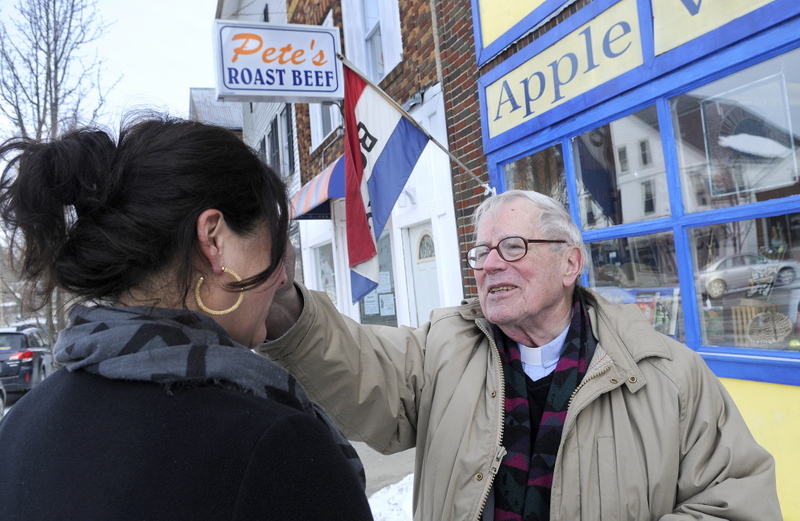 Linda Parker, owner of Pete’s Roast Beef, next door to the bookstore, took advantage of the chance to have ashes applied while keeping her restaurant open. Parker, who also is Catholic, didn’t realize Gill was an Episcopal priest until she talked to him. The distinction mattered little to Parker, who said she regularly celebrates Lent. Receiving the ashes is part of that process, she said. 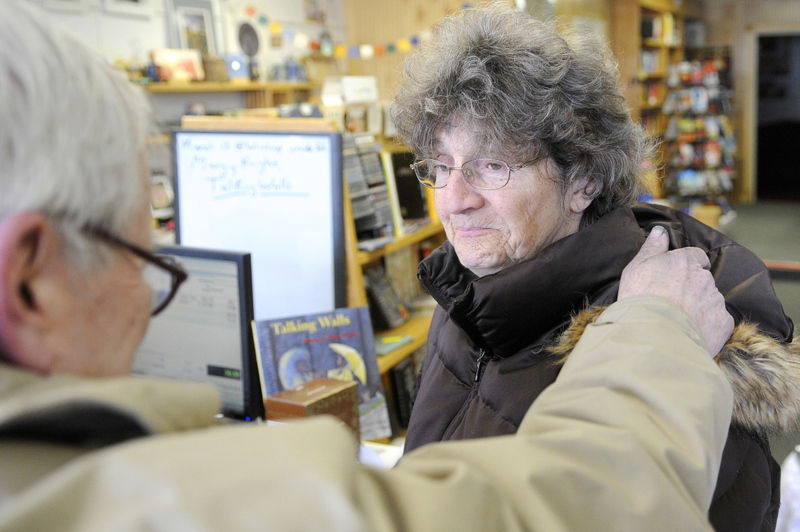 Madeleine Roy, of Wayne, stopped by the store for some books and gladly agreed to accept Gill’s offer to have ashes applied. Roy, who is Catholic, had forgotten it was Ash Wednesday. As Gill finished applying the ashes, he and Roy echoed an “amen,” which in Hebrew means, “so be it.” The phrase fits with Gill’s view of Ashes to Go. If people want ashes, so be it. If they don’t, so be it.